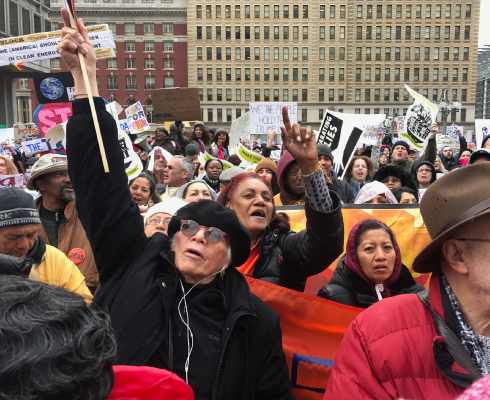 On April 15, over 60,000 workers and allies took part in demonstrations in 200 cities across the country to demand a raise in the minimum wage to $15. The Center for Popular Democracy (CPD) and two dozen of our partners across 26 states lifted up the voices of working families struggling to make ends meet in a broken economy. This most recent day of action was the largest to date of the now two-year long “Fight For $15” campaign, highlighting the growing moment this movement of workers, students, racial and climate justice advocates, unions, and small business owners is gaining. In Chicago, Fight For $15 organizers worked with the Black Youth Project 100, a racial justice organization, to draw connections between the Black Lives Matter movement and the fight for a higher minimum wage and union rights. In New York City, community members participated in a die-in outside a Manhattan McDonald’s and spoke about the link between racial violence and the economic violence caused by poverty wages. In Oakland, CA, former US Secretary of Labor Robert Reich met with striking workers as they walked off the job at a McDonalds. And across the country, striking Fight for $15 workers were joined by student groups, childcare organizers, home care attendants, nurses, adjunct faculty, construction workers and others who have joined the movement for economic justice under the Fight For $15 banner. As workers and their allies push the fight for livable wages into the national dialogue and are able to draw support from an ever-widening base, the movement for fair wages is sure to have a huge impact as presidential elections draw near.